They are the best 18′ Skiff team in the world, and have now added the ANZAC Championship to their impressive line up of regatta wins. The regatta was held over three days hosted by the ASC Skiff League and their home club, Royal Akarana Yacht Club. JJ Giltinan World Champions (Australia), European Champions (Italy), Mark Foy Champions (Fiji), New Zealand Champions and now the 2018 ANZAC title after three days of competitive racing on their home waters in Auckland. Although their worst result was a second, they did have to fight their way through the fleet with Honda Marine skipper David McDiarmid saying that Erica Dawson will definitely be one to watch in the future. “Erica had an awesome first regatta sailing with Hoff (Dave Hazard) and Jack (Simpson),” said McDiarmid. “They had us on our toes a few times which was great to see for the new talent coming through the ranks. Of course it would have been great to see more Aussie boats on the start line, so hopefully they can make the short trip across the ditch next year,” continued McDiarmid. Second overall after an up and down regatta was Alex Vallings and his merry C-Tech men, who although were suffering from injuries, were able to keep themselves at the pointy end of the fleet. “Overall we had a good regatta. Few little bugs here and there, but can’t really complain with a second,” said skipper Vallings. 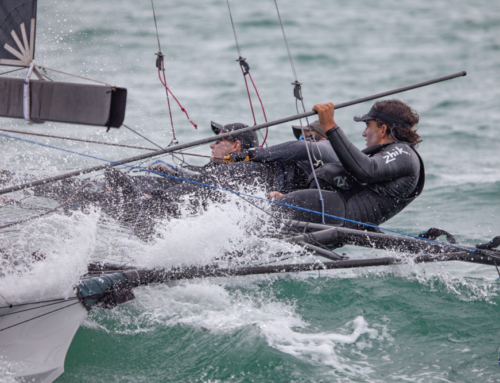 Erica Dawson, Dave Hazard and Jack Simpson were definitely the team to watch for this regatta, with the 49erFX sailor taking the helm of an 18′ Skiff just 30 minutes prior to the first race on Saturday 21st April. Hazard and Simpson were part of the Maersk Line team that took second at the 2018 JJ Giltinan, and they are also 49er sailors. The top placed Australian boat was Yandoo, who finished 4th overall. 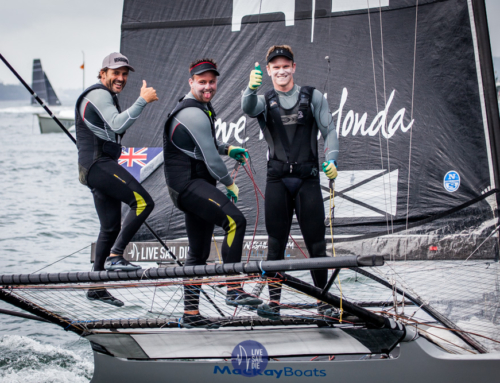 John Winning, Cam McDonald and Michael Kennedy enjoyed the racing on Auckland Harbour and were happy with their result. 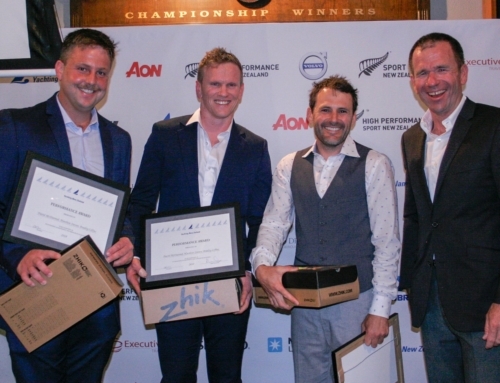 “All in all, it was a good regatta in Auckland,” said Winning post prize-giving. 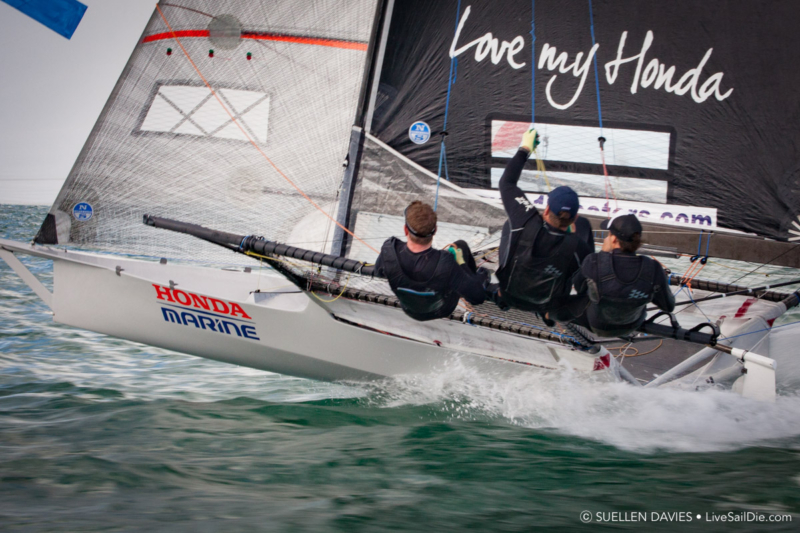 While some of the Australian boats will now head to Italy for the European Championship, the Kiwi fleet will undergo some serious recruitment to fill the available boats. Trials will take place leading up to the opening of the 2018/2019 season in October. Information on how to become a part of an 18′ Skiff team will be available in due course.